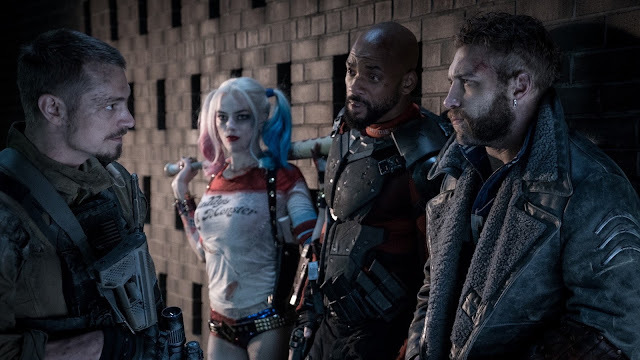 Suicide Squad is an aimless mess that occasionally flirts with passibility due to its mostly likeable performances from an altogether interesting cast based on the John Ostrander comic. Writer/director David Ayer delivers a crazy mishmash of comic book supervillains, some fairly iconic and less iconic characters, a rather lackluster story, and predictable final battle finale somewhat reminiscent of the original Ghostbusters all set in the DC Universe. Will Smith as Deadshot is the closest thing the film gets in a sort of protagonist, but he's abandoned through the middle portion of the film, after multiple introductions, and is saddled with a daughter storyline that's never truly earned or paid off. It doesn't help how often he discusses his status as a murderer and hitman for hire with loose morals yet is suppose to be anchor the story. Smith's natural charisma still makes enough of it work somehow. Jared Leto's Joker kind of walks through the film as an afterthought and drifts in and out of flashbacks with zero impact of his own aside from tracking down his psychiatrist turned girlfriend in Harley Quinn played by a very game Margot Robbie. She shows her full-range of acting skills recreating the cartoon character in the real world with enough charm and physicality to distract from the non-sensical things happening around her. Joel Kinnaman as Rick Flagg leads the team of criminals, dubbed Task Force X, but is dragged down by some unenviable emotional heavy lifting. Viola Davis is strong, stoic, and ruthless as the shady government official, Amanda Waller, who recruits the criminals. Jai Courtney as Captain Boomerang basically has no reason to be in the film except to say one-liners in his native Australian accent and throw boomerangs for some reason. Cara Delevingne tries her best but never really lives up her mystical witch character in Enchantress, the film's ultimate villain of all villains. With such a bizarre film and set of characters and a ridiculous Dirty Dozen style criminal plot, the film quickly devolves into a world saving plot complete with a mysterious beam in the sky. Characters like Katana (Karen Fukuhara) and Slipknot (Adam Beach) just show up and disappear with little explanation or motivation. Jay Hernandez's El Diablo is one of the few given a somewhat full but largely wasted arc unlike an almost forgettable Killer Croc (Adewale Akinnuoye-Agbaje) who's just there. Surprisingly, there's still occasionally somehow enough things to like from such a talented cast and crew. Ayer mixes in so many classic and contemporary pop hit songs—many overly on the nose—in between Steven Price's propulsive score. Roman Vasyanov's mostly illuminating cinematography saturates the film bringing many of the colourful comic book characters full to life, however, brought down by the inconsistent storytelling. Suicide Squad is ultimately a jumbled mishmash of disparate comic book villains and recycled ideas. Ayer's direction is slick and stylish but his script and character development are completely out of whack. The pacing, rushed but endless expositional flashback structure, choppy editing, and unexplained story elements sink any momentum the characters and acting try to maintain while dragging down the whole concept of the DCU.